64N 18E, the fourth and last confluence to be visited on our three-day tour of Västerbotten, was approached from the south from Häggsjömon. After a couple of miles driving we crossed the river Flärkån, which we then followed east towards what, according to our map, was the closest we could drive to the confluence. Like most waters in this area heavy raining had made Flärkån flood, making it completely impossible to cross by foot. Our biggest worry, then, was if and where we would find a bridge which could take us over the the streaming water. Soon, perhaps a bit too soon for our liking, we saw something which appeared to be a bridge. When we got closer we saw that it really was a bridge, but that it had collapsed and was half way down into the river. Worried that we would not find another bridge and that we would have to approach the confluence from a different direction making the hike almost twice as long, we continued along the river. To our big relief we soon found another bridge, older than the first one but definitely of a stronger build. We stopped the car immediately, crossed the bridge and continued towards the confluence. According to the GPS we now had a walk of about 1,5 kilometres ahead of us. This did not seem like a problem, but soon the terrain started to slow us down. Hills had to by climbed, bogs had to be rounded and creeks had to be crossed. After about 20 minutes of bushwacking we came to a funny looking clearing. Could it be? Is it? Yes. It is a perfectly good road. Although you might think that a road can not mock you, this one surely seemed to do just that. After crossing the newly discovered road, which obviously was too new to be on our old map, it took us about 10 minutes to reach the confluence. We took our pictures and headed back the same way we came, although this time we took the road back to our car. On our way down to the road we found, what in Swedish is called a ”hackspettsmedja”, a ”woodpecker’s workshop”, that is, a trunk in which a woodpecker (probably Dendrocopos major) had wedged cones in order to pick out the seeds. The workshop was well used and it was interesting to see how hard the woodpecker had wedged the cone into the score of the trunk. The surrounding area of 64N 18E was not that exciting. 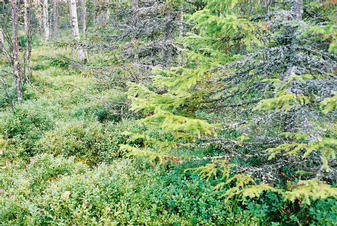 It was the kind of forest you find in most parts of Västerbotten. The drive along Flärkån, however, was a nice surprise. Again, we have the Degree Confluence Project to thank for a pleasant discovery.